Sounds like the title of a bad horror movie doesn't.. but it's not. I usually avoid Leicester Square these days as the renovations make it feel like a cross between a building site and a bomb site. 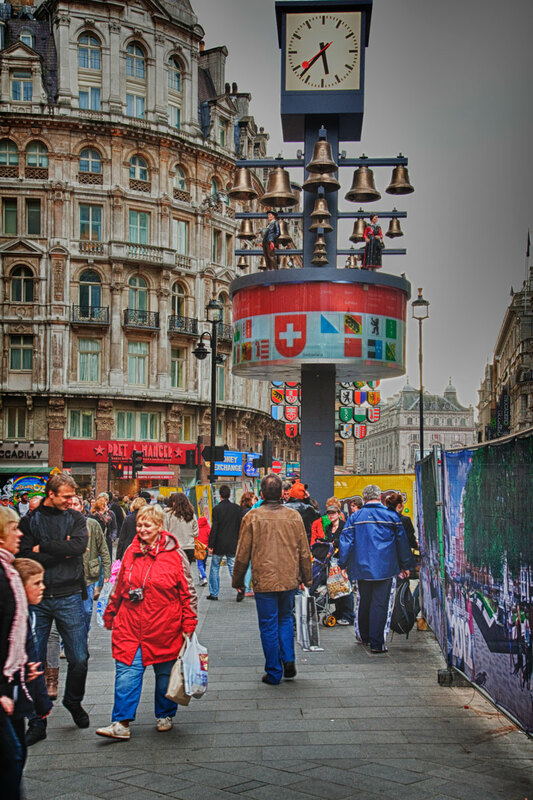 The other day I took a short cut through the square and I was surprised to see this clock (Glockenspiel) in the middle of the chaos. A bit of research and I found it has been there since November, having been away for renovation since 2008. The clock was a gift to the city in 1985 by Switzerland and Liechtenstein as a token of the centuries of friendship between the three nations. It is a musical clock (naturally) with 27 bells and 11 moving Swiss figures. Is there music every hour? How observant am I? I never knew it existed. How much fun would that be to see on the hour?! That is amazing. I'd love to hear it 's tune! I Remember it and I'm happy to hear that it's back. Very nice! Wow, wonderful idea, and a great shot too. I didn't know about it either. It wasn't there last time I visited London, which would have been during its renovation. It's delightful! How can the passers-by ignore it? No-one in your photo is looking up at it. Familiarity, I suppose.